This is a rave, I guess. 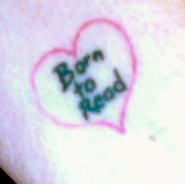 Below is a link to pictures of some pretty cool book-related tattoos. But, first, here’s a photo of mine. It’s not as pretty, but it cost and hurt a hell of a lot less than the ones featured by Mental Floss. This entry was posted in Rave, Uncategorized and tagged Book-related tattoos, Librarian, Librarian Tattoos, Mental Floss, Tattoo. Bookmark the permalink.